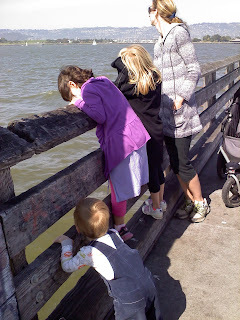 We all went out to explore the Berkeley Pier this afternoon. John was enthralled with the waves and water, especially when he realized that he could look through a seam in the concrete pier and see the water below. The girls and Rudy made their way quickly to the end, despite the high winds. Lots of sun, sail boats, and kites (back on shore).